I have been busy over the last couple of days! Not only with scrapbooking but also with some other projects, like Nordic Walking for instance! Because of the Fibromyalgie (don't know the English name for it, but it is rheumatism of the muscles) it is sometimes hard for me to get enough exercise. Last week I started NW with a joung woman living nearby. She's a NW instructor and a physiotherapist. Because my condition is realy poor we only walk for half an hour and I feel very tired afterwards. I'm sure that will change in the nearby future! I have made 2 LO's. The first one with pp I bought last Saturday. I had this idea in my head but it didn't work out. So it was quit a project to finish this one and to feel more or less content about the outcome! I love the photo of Zander with his guinea-pig called Janneke. He his holding her so tenderly in his arms! Supplies: pp Scenic Route PC, cardstock (Action, Aldi), felt (Xenos), staples, dymotape, black pens. 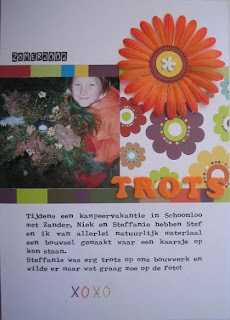 The second LO is about my niece Steffanie and a "piece of natural art" we made during a campingtrip in 2002. She was so proud of it! Trots means proud. Again, I was inspired by Revlie. Supplies: pp American Crafts, cardstock (Action), flower (Zeeman), foamletters (Wibra), font typewriter, embroidering-thread, brad (OTC), black pen. Well you seem really busy...but when you get some time off i'd like you to visit my Love Blog sometime and share some of the love it's filled up with!!! Your English is wonderful. Fibromyalgie in Dutch is Fibromyalgia in English. Medical and anatomical terms often seem very close. I am a writer, working on a Nordic Walking book (and also maintaining a blog at http://nordic-walking-usa.blogspot.com. I'm interested in how Nordic Walking relieves your fibromyalgia -- and whether you started this fitness program on your own or on a doctor's recommendation. If you like, you can post your response here or E-mail me at cmwalter@claire-walter.com.